In his liner notes, the bassist Barry Guy clearly sees the dichotomy in the nature of the artist. One aspect being his impulse to adorn his work so as to entertain and at the other end, if you like, is the intent to awaken the collective social consciousness of its audience into perceiving its message. The example that he presents here, his composition, The Blue Shroud does just that. However, unlike the stasis that might ensue from viewing a painting or a sculpture, poetry and music can be provocative. Once unleashed, a chain reaction ensues from its audience. One example that comes easily to mind is “La Marseillaise”, adopted as the national anthem of France. The song was written in 1792 by Claude Joseph Rouget de Lisle in Strasbourg after the declaration of war by France against Austria, when it was originally titled “Chant de guerre pour l’Armée du Rhin” (“War Song for the Rhine Army”). Picasso’s painting Guernica may not have been conceived to work that way, but what it did, and continues to do today, is elicit intense feelings of fear and loathing for the events of the bombing of the Basque city of Guernica by the Germans at Francisco Franco’s behest during the Spanish Civil War of 1937. The Blue Shroud that covered the painting before Collin Powell was set to seek the United Nations’ assent to go to war in Iraq, though not a work of art, was not only an attempt to obscure one (the painting) but also an attempt prevent the violence of Picasso’s painting from seeing the ugliness of the war that was about to be perpetrated upon a people. And then there is The Blue Shroud, Guy’s composition that tells the story of both the painting and the attempt to obscure it. While it is not an attempt to lead men to war, or to protect a nations-state, it certainly is provocative, both in the musical form and devices used, in the poetry of Kerry Hardie as well in the recitations. For instance orchestral dissonance creates –and, perhaps, stands for feelings of fear, disgust, helplessness, and so on. The gravitas of the bass is not lost in this mêlée either. Its rumble and guttural moaning instantly grates the consciousness. As the composition develops, musical instruments battle each other tumultuously, signifying not only the bloodletting of war, but worse – man’s inhumanity to man. Poetry adds mercurial drama to the music and recitation by Savina Yannatou oscillates from low whispers to piercing cries both os which add to the visceral nature of the work. Listeners might quibble about the forceful treatment of the material’s middle passages – a muscular forte rather than an expected mf but there can be no argument of the strength of purpose that courses t through the readings by the strings, of the deeply moving composition, including its powerful poetry, the elegant proportion of the instinctive ebb and flow of the music which depicts the pathos and catharsis of the work. Bach’s ‘Agnus Dei’ for the B minor Mass, at the composition’s dénouement makes a powerful and poignancy statement: that the penitent soul deserves mercy. This is a most compelling work by Barry Guy. 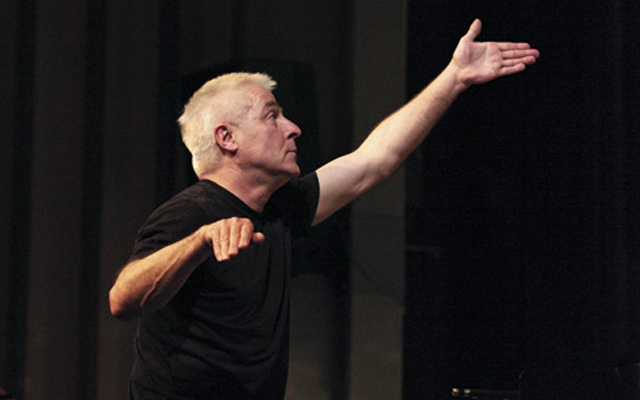 In its dramatic use of tonal colour, its use of superbly crafted accents to represent both the violence of humankind as well as forgiving nature of God (via Bach’s aria) and the splendour of poetry Guy peals away The Blue Shroud from the Guernica, creating, in the process a significant musical work, a call to action as music should and that is: it should halt human beings in their tracks as they ponder the need for another war. Track List: The Blue Shroud – Prelude; Song 1; Song 3; Bull/Mother and Child/Warrior; H.I.F. Biber, “The carrying of the cross” Mystery Sonata IX; “A blinded bird of hope” (Song 4); Bird; H.I.F. Biber, Aria from “Crucifixion” Mystery Sonata X (Song 7); Light Bearer; Fugitive; J.S. Bach “Agnus Dei” from the b minor mass. 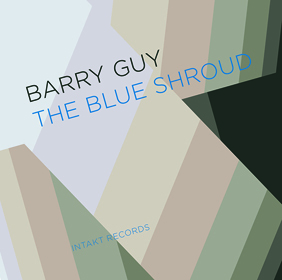 Personnel: Barry Guy: bass, director; Savina Yannatou: voice; Ben Dwyer: guitar; Agustí Fernández: piano; Maya Homburger: violin; Fanny Paccoud: viola; Percy Pursglove: trumpet; Torben Snekkestad: soprano saxophone, reed trumpet; Michael Niesemann: alto saxophone, oboe; Per Texas Johansson: tenor saxophone, clarinet; Julius Gabriel: baritone saxophone; Michel Goddard: tuba, serpent; Lucas Niggli: drums, percussion; Ramón López: drums, percussion.